If you are skilled in sewing, one niche to consider is the figure skating market. As the Winter Olympics draw to a close with figure skating as one of the marquee events, interest in the sport is expected to spike up. Ice skating rinks around the country usually see an increase in enrollment in ice skating lessons after the Winter Olympics as more kids want to learn ice skating and be like one of the top skaters they see on TV. Figure skating is a small participant sport with a limited customer base. The U.S. Figure Skating currently has about 165,000 members in the country. USFS members are those who compete in USFS-sanctioned events, including the U.S. nationals and those who are sent to compete in international figure skating events such as the Olympics. The number increases if the non-USFS members, typically those in the Ice Skating Institute (ISI) track such as the younger kids taking group lessons, are accounted for. According to the Ice Skating Participation Report prepared by the Sports and Fitness Industry Association, it is estimated that there are about 1,728,000 core (13+/year) ice skating participants in the U.S. in 2012. To start a sewing business for the figure skating market, you need to be familiar with the sport and skating fashions. Figure skating has special requirements in terms of outfits and costumes, with strict rules that needs to be followed especially for higher level competitions. Figure skating costumes must combine performance requirements with fashion and beauty. The skating outfit must fit well, look good on the ice from all angles, complement the music yet allow the wearer the freedom of movement. Even for practice, figure skating outfits must be form-fitting that stretch. As one article said, “the outfit must function like a workout gear while looking like a sparkly evening gown.” Top designer Vera Wang, who created top costumes for top skaters such as Michelle Kwan and Evan Lysachek, described the best figure skating costumes as those that understand how the skater’s body moves and their particular balance and artistry. Clothing needs to be free of excessive decorations such as feathers that may come loose on the ice and create a skating hazard. While the rule that ladies can only wear dresses that cover the hips and posterior has been relaxed and women can now wear pants, most girls in competition still wear skating dresses. The dress, however, must provide 50% coverage of the body trunk for women. Boys, on the other hand, must wear trousers (tights not allowed) and sleeves are required. The quality of stitching is important to ensure that the dress or costume last the skater at least for the duration of the season. Competitions typically start around spring and last fall for the regionals or until winter for those able to go to the nationals. Plus, good stitching is required to ensure that the dress does not fall apart during the performance and to prevent any wardrobe malfunction. Figure skating is a world where rhinestones reign supreme. Figure skating outfits, especially for girls, tend to be sparkly and ornate. The high level competitive skaters wear the finest custom-designed bejeweled dresses that looks gorgeous when spinning or gliding on the ice. Dresses are typically bedazzled, designed with sequins, crystals and glitters. Even practice pants and jackets tend to be designed with sparkles. However, it is important that dresses should not be bottom-heavy so as not to affect jumps or spins. For higher level competitors, costumes take into account the music and the character the skater wants to convey. Skaters pick their music first, then create the program and choreography, and then build the dress or outfit around them. It is important for the dress to be age- and level-appropriate. For individual figure skating events, outfits are typically selected by the parents in consultation with the coach. Coaches tend to have the deciding authority for team events such as synchro or theater on ice. Competitive skaters are those who participate in at least about 2 competitions in a year. Between the ages between 8-24 years old, competitive skaters are kids who have been skating for at least 2 years and tend to compete in US Figure Skating events all the way to regionals, sectionals and the nationals. These are the skaters who practice at least twice a week, with many skating every weekday and spending an average between 10 to 20 hours per week on the rink. They tend to skate primarily with at least one private coach, as against skating only in group lessons. These skaters need practice outfits as well as costumes for use during their competitions for the season. They tend to wear one costume per event for that entire season. Some skaters who compete in both freestyle and showcase or artistic events will need different costumes for each event. Apparel and gear stores located in ice skating arenas and rinks mostly sell figure skating dresses and practice clothes for girls, with a couple of men/boys shirt in the mix. While boys are a minority in figure skating especially in the lower levels — one level could have as many as 60 girls competing as compared to only 5 boys — this segment grows in number as the level increases. These are mostly young kids taking ice skating group lessons (as opposed to those with their own private coaches). The younger kids tend to practice with their snow clothes, while the older ones (or those who have more ice skating experience) tend to use figure skating pants. While this market do not need figure skating dresses or fancy boys costumes, ice skating rinks tend to organize a once-a-year ISI-sanctioned competition where most students in the local arena participate in. These competitions can be a big market for figure skating dresses and outfits. Synchronized skating is a team sport consisting of 8-20 skaters doing a program together. Their performance is judged based on teamwork, speed, intricate formations and step sequences. Synchronized skating teams require costume for the entire team. Coaches typically work closely with the costume designer to ensure that the skating outfits of the synchro team members capture the theme and music of the program, as well as fit the budget of the team. Costumes are then individually cut and tailored to fit each individual skater. Some figure skating apparel and costume designers focus on this niche. Theater on ice, or Ballet on Ice as it is often called in Europe, is a competitive figure skating sport that combines figure skating with the drama and fun of theater and dance. Teams consist anywhere from 8-30 team members. Unlike synchronized skating where athletes wear matching costumes, members of theater on ice teams require different costumes based on the theme of their production number. A zoo-themed production number can have one group of skaters wearing monkey costumes, another with penguin costumes, and so on. One production number may require several costume changes. There is a small segment of adults competing in figure skating, both men and women. 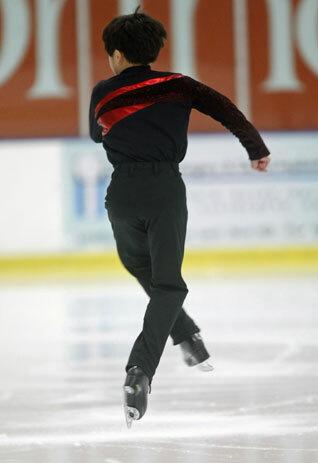 Adults compete in free skate events, as well as dance events, pairs, interpretive, jumps and spins, and compulsory moves. There are also a small number of adult synchronized skating teams.